We’d love your help. Let us know what’s wrong with this preview of The Demon Soul by Richard A. Knaak. Led by the mighty Archimonde, scores of demonic soldiers now march across the lands of Kalimdor, leaving a trail of death and devastation in their wake. At the heart of the fiery invasion stands the mystic Well of Eternity -- once the source of the night elves' arcane power. But now the Well's energies have been defiled and twisted, for Queen THE BURNING LEGION HAS COME. To ask other readers questions about The Demon Soul, please sign up. https://foxstore.pro/ Has anybody tried Arena Boost Service on from Foxstore Pro? I have heard from my friend - they finished 0-2000 Rating in 3v3 just in 2 hours! The second novel in an original trilogy of magic, warfare, and heroism based on the bestselling, award-winning electronic game series from Blizzard Entertainment. The night elf defenders, led by the young druid, Malfurion Stormrage, and the wizard, Krasus, fight a desperate battle to hold back the Legion's terrible onslaught. Though only embers of hope remain, an ancient power has risen to aid the world in its darkest hour. The dragons -- led by the powerful Aspect, Neltharion -- have forged a weapon of incalculable power: the Dragon Soul, an artifact capable of driving the Legion from the world forever. But its use may cost far more than any could have foreseen. I'll admit I'm considering the one-star rating for answering two of my most important lore questions in the worst manner possible, but I suppose I'll have to be rational. I like the Warcraft Universe so much that I left aside the poor choices concerning the writing style, the rather limited vocabulary and stylistic choices. I found that at times the author over-played the beauty of the female characters, if anything, aiding to the stereotyping of women. Warcraft and World of Warcraft is one of the few games where a gear set put on a male character is the same as the one on a female character, without unnecessarily revealing breasts, hips, legs. So, considering the I like the Warcraft Universe so much that I left aside the poor choices concerning the writing style, the rather limited vocabulary and stylistic choices. I found that at times the author over-played the beauty of the female characters, if anything, aiding to the stereotyping of women. Warcraft and World of Warcraft is one of the few games where a gear set put on a male character is the same as the one on a female character, without unnecessarily revealing breasts, hips, legs. So, considering the book was based on the game, I would have appreciated some decency in terms of clothing description. When reading a book the reader should feel some type of emotions form the book to better understand the characters thoughts and understand the characters actions. Richard A. Knaak does a interesting job at describing the feelings of the characters and others through either the environment of the character. This review is about the book Warcraft: The Demon Soul by Richard A. Knaak. It takes place in the magical world of Azeroth where night elves rules and other magical races are under classed. I When reading a book the reader should feel some type of emotions form the book to better understand the characters thoughts and understand the characters actions. Richard A. Knaak does a interesting job at describing the feelings of the characters and others through either the environment of the character. This review is about the book Warcraft: The Demon Soul by Richard A. Knaak. It takes place in the magical world of Azeroth where night elves rules and other magical races are under classed. It has been this way for centuries until the arrival of the burning legion, a army of demons whose soul purpose is the destruction of all life. With this arrival the world set a blaze, night elves fight defend their homeland while others plan on how to save the world. Among those is the great dragon aspect Netltharion. He has guarded the planet with his fellow aspects for millenniums but form a mysterious force his mind is being corrupted. What is to be expected form the great dragon has yet to be seen. Following Netltharion’s corruption comes madness. Richard A. Knaak uses of emotional words gives a more in-depth look into each specific characters emotions and gives foreshadowing for what the character might do next. An example is from page 245. During this scene Neltharion is in his domain alone hearing voices that lead him into false emotions. It says “Over and over, the voices repeated such dire things, warning him of duplicity, betrayal.” The use of the word betrayal gives the reader a better understanding of why Neltharion is so mad and why he begins to pan against his friends. The author doesn’t just stop there but uses more words to describe the certain emotions of characters. On page 275, Captain Varo’then sees how much his queen loves another more than him. It says, “A pang of jealousy struck the officer”. Through this whole book the reader will encounter sentences like these. The one thing is that the book does reveal so much emotion that it isn’t hard to find out the next part of the book. This decreases the suspense and thrills of the book just a tad but it makes up for it with descriptions. کتاب اهریمن روان جلد دوم از مجموعه ی نبردباستانیانه که من اونو برای پنجمین دور کتابخوانی فارسی در گروه پرسی 3 خوندم. باید بگم نسبت به کتاب قبل زیبایی بیشتری برام داشت شاید به این خاطر که دیگه شخصیت ها توی ذهنم تثبیت شده بود و می دونستم از هر کدوم چه انتظاری می ره. اما بازم نویسنده هرگز اجازه نداد که بر اون پیش دستی کنم و همیشه در گوشه کنار سوپرایزی برام تدارک دیده بود. داستان اوج و فرود خوبی داشت اما ترجمه ی این جلد به خوبی جلد قبلی نبود. گاهی چند بار جملات رو می خوندم تا معنا و مفهوم واقعی رو د کتاب اهریمن روان جلد دوم از مجموعه ی نبردباستانیانه که من اونو برای پنجمین دور کتابخوانی فارسی در گروه پرسی 3 خوندم. باید بگم نسبت به کتاب قبل زیبایی بیشتری برام داشت شاید به این خاطر که دیگه شخصیت ها توی ذهنم تثبیت شده بود و می دونستم از هر کدوم چه انتظاری می ره. اما بازم نویسنده هرگز اجازه نداد که بر اون پیش دستی کنم و همیشه در گوشه کنار سوپرایزی برام تدارک دیده بود. داستان اوج و فرود خوبی داشت اما ترجمه ی این جلد به خوبی جلد قبلی نبود. گاهی چند بار جملات رو می خوندم تا معنا و مفهوم واقعی رو درک کنم. به نظرم ترجمه ی اسم به فارسی هم خوب نبوده اما بازم دوستای صاحب نظر توی عرصه وارکرافت به نظرم در این رابطه نظرشون بر من مقدم تره. خلاصه این که این جلد به خوبی تونست فانتزی قهرمانی رو به تصویر بکشه و بعضی از صحنه های نبرد هم واقعاً خیلی زیبا توی ذهن مصور می شدن که اینا همش مدیون قلم نویسنده بوده. به عنوان یه فانتزی خون و یه فانتزی پسند تا اینجای کار از وارکرفت خوشم نیومده . راست و بی تعارف . حالا بزاریمش پای بی سلیقگی من راحت تریم یقینا . یه مقداری جادو تو دنیاش بی در و پیکر هست . آخر کار ملفاریون یه فن جدید رو می کنه و هوتوتو ! هر چقدر دشمنش گنده باشه هم منهدم میشه . خوب چه کاریه از اول رو کنه این ورد و جادو و وقت مارو هم نگیره . دنیاش خیلی خیلی بزرگه انصافا و من هنوز توش گیج می زنم بعد از خوندن دو جلد . "The Demon Soul" continues where the first book of the trilogy left off. Krasus and Rhonin, who are from the future, have joined forces with the night elves of Azeroth's past to defeat the Burning Legion. The Burning Legion is an ancient force of evil demons who are attempting to take over the world. This book delves into the dragons, and the creation of the Dragon Soul - an artifact that has the potential to drive away the Burning Legion...but only if it is used properly. Its creator, Neltharion, will become a figure of Warcraft legend...but not for the right reasons. His name will become synonymous with evil, just like the Burning Legion. "The Demon Soul" further fills in the history of the War of the Ancients, giving Warcraft fans a fun romp through the past of their favorite world. In it readers learn more about the dragons, the night elves, the first druid Malfurion, and more. Also in it the downfall of Illidan, one of the great bosses of the Burning Crusade, is depicted. Like the first book in the trilogy, "The Demon Soul" is an enjoyable read. This isn't meant to be high or original fantasy - it's based on an established game series, but Knaak doesn't let that stop him from writing an interesting book that will surely be enjoyed by Warcraft fans. There's plenty of action, plenty of battles and fights; character development for many of the legendary game figures; and more lore. One thing I love about this Warcraft trilogy is that reading it always makes me want to go back and visit the parts of the game that were described, or visit the characters that were given detail. The three friends a mage a wizard and a veteran warrior try to fight a demon lord by combining their powers.and its beginning with the highborne calling on the demon lord archimond. want. they want to go home and be able to be with their family's . and be with their own kind because their a dragon a human and a orc. because they are stuck in a time period where literally anything could end up killing them. obstacles. a giant army of demons known as the BURNING LEGION who kill everyone who they encounter. the whole legion of black flight of dragons led by their insane leader Neltharion. and their both groups are ending trying to get in their way and kill them all. what do they do. they try to beat them with sheer power which is kinda crazy. and lead the whole army of night elves against them to save them. 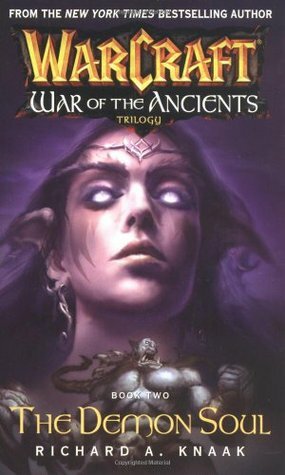 A continuation in the War of the Ancients book series. Again, we have Rhonin and Krasus with a few friends trying to stop the Burning Legion taking over Azeroth and it flies along at a fast pace. I thoughly enjoyed this book as I do play the game and I am a huge lore nerd so finding out about the book series is a huge trip for me. To find out about the Guardians of Hyjal and everything how Azshara progresses as a character was what kept me entralled in this book. But don't read it if you've not A continuation in the War of the Ancients book series. Again, we have Rhonin and Krasus with a few friends trying to stop the Burning Legion taking over Azeroth and it flies along at a fast pace. I thoughly enjoyed this book as I do play the game and I am a huge lore nerd so finding out about the book series is a huge trip for me. To find out about the Guardians of Hyjal and everything how Azshara progresses as a character was what kept me entralled in this book. I liked this one a lot more than the first. The author used a more diverse vocabulary and not the same phrasing over and over ("the latter", etc). The first book was irritatingly repetitive and I was glad to feel like he put time into this book. There is a lot going on at one time, but he manages to juggle the stories well. It didn't feel unfinished. There was a clear progression to the last book. Very nice detail and wonderful ideas that made me stop and share specific scenarios with my family. I' I liked this one a lot more than the first. While the first volume of the trilogy did not flow smoothly, this second volume does not have the same issues and is quite entertaining and fast paced. While Malfurion Stormrage and his brother, along with Rhonin, Krasus, Brox and Tyrande fight with all the night elves against the demons of the burning legion that are devastating Azeroth, the dragons, guided by Neltharion, are working on a powerful artifact to stop the demons. I thought that this was an amazing book, I began to read this right after I had finished the other. These books are always very interesting to me because of how I am so interested in the lore. It is very interesting to find out about what is behind the video game. These are very well written books, the only difficult part is at times the book seems to jump between characters and it takes me a few paragraphs to catch back up to who is talking, other then that I thought these books were amazing. It starts off a bit slow, but picks up and really pulls you in especially towards the end. Really can't wait to start reading the third in the series to see how things turn out as there are a lot of loose ends at the end of the book. These characters continue to be built upon and you really get a sense of what they're all about. 2nd book of the amazing trilogy. This continues on how the Aspects(Dragons who rule the world) are coming together with a plan to stop the Burning Legion but end up being betrayed by one of their kind. The story is engaging with battles depicted clearly. An amazing read that hangs at the end of the book leaving me waiting, I mean, dying for the final book. Way better than the first! A ton of action and the story picked up and went off at a decent pace. Time travel + fantasy. Two of my favorite genres. If you love Warcraft lore, or if you just love fantasy books in general, you should give this a shot. I can't wait to finish the last book of the trilogy. Druhý díl této série byl zatím to nejlepší, co jsem od Knaaka četl. Kniha narvaná akcí, kdy se proti sobě střetnou zástupci různých ras a démoni z Plamenné legie. To vše je provázáno příběhy jednotlivých postav, které jsou stejně zábavné a čtivé. Prostě úplná spokojenost. I really enjoyed getting to know the characters in this book. I was a little disappointed that there was a cliff hanger at the end even though I know there is another book - I still expected a sort of wrap up like the first one had. I am anxious to start the next book! Great book with so many epic fundamentals to the development of Night Elves . Even if you are a Horde fan there is Brox story as well. Most importantly the book writes the first appearance of Sargeras. Definitely a book you do not want to miss. It adds a lot of detail if you play the game as well. Definitely a must read for WoW lore fans and fantasy lovers. A fascinating turn of events to an already thrilling story. Knaak can lose me sometimes by the way he explains the scenery from the lack of more details, but the story is trully worth it. This review has been hidden because it contains spoilers. To view it, click here. The second in the trilogy, my love for Broxigar continues, as does my enjoyment of reading about Korialstrasz and the other dragons. But still was Warcraft and "Warcraft is Awsome!!" People were saying that they liked this book more than the first one, and I have to agree :-) I'm learning so much lore, must . . . learn . . . more!